Join us for the opening event of the 2018 YORights festival – a mix of film screenings, radio, and live theatre. This year we celebrate the 70th anniversary of the Universal Declaration of Human Rights. Our first film, TRUE WARRIORS, tells the story of a small group of artists from Kabul whose premiere of a daring piece about suicide bombings was itself attacked by a suicide bomber. 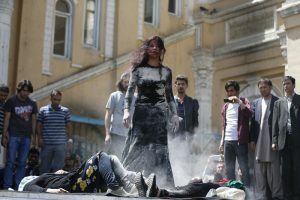 Some of the survivors fled to Europe in the aftermath of this attack, others decided to stay in Kabul and push the limits of what they can achieve as artists, taking their performances to the streets and accepting radically more risk. The film screening will be followed by a debate/discussion around reconciliation and recovery after violence. The film is unsuitable for under-16s.